Harley Davidson, Disney, and Tornadoes. What do all three have in common? They’re all Retro 51 pen collections, of course. Established in 1991, Retro 51 is redefining the way we think about pens. The company makes affordable, unique and original pieces that anyone would want. From Tinkerbell and Mickey Mouse to Full Throttles and Road Writers, Retro 51 has a pen for you, especially with the addition of new pieces to the already popular collections. In continuation of the distinctive Harley Davidson collection, Retro 51 released the Flathead line. This includes three new pens designed around Harley’s Flathead engine. Like the flathead engine, the pens are powerful in their simplicity. 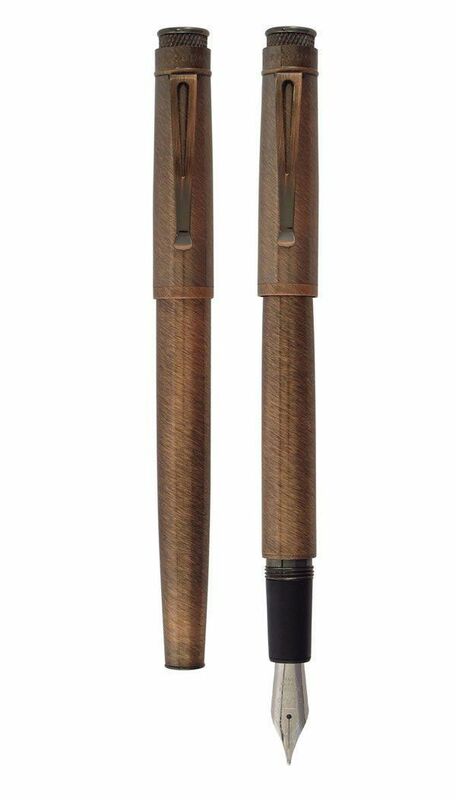 Along with the new line of Harleys, Retro 51 also added the Abbondonza pens. This collection was named for the Italian word meaning, “more of everything,” which pretty accurately describe these pens. They are made from acrylic resin to ensure their beauty and long life. As if the Harleys and Abbondonzas weren’t enough, the company also updated some classics. The Scriptmaster is now available in the second series, and the Tornado Rollerballs now come in five new colors including ice blue, Venetian marble, purple, charcoalium and Verona marble. One thing remains constant with these pens; they are unlike any designs I’ve ever seen. Check them out at Executive Essentials. It’s mid-August and at least in the United States, summer seems to be slowing down. The rushing spring thaw has run its course and the rivers are returning to recreational normal. And, as if in inverse relation, the slower the rivers run the faster the back to school sales start to flow. That is if you live in the northern hemisphere, which typically sees a September to June school year. However, if you live in another country not aligned with the Northern hemisphere, your back to school season has either ended or is a long way off. Being from North America, it’s interesting to think that in Australia, students attend school for 200 days a year from late January to mid-December. This is partially because Australia is in the southern hemisphere and they have their summer while it’s winter in the northern hemisphere. The school year in Australia has 4 terms. Each of the terms lasts about 10 weeks. Between each term, students get roughly two weeks of vacation. Other countries in the southern hemisphere have similar schedules with slightly different hours, such as Brazil, which only has school from 7 in the morning till noon. But, just being in the Northern Hemisphere doesn’t mean that a country has a relaxed September to June schedule. China is in the northern hemisphere, but it has a summer school schedule that runs from the beginning of September to mid-July. Unlike the long summer vacations in the Americas, Chinese students spend their summer vacation in classes or studying for entrance exams. The typical Chinese school day runs from 7:30 a.m. to 5 p.m., with most schools stopping for a two hour lunch break. Regardless of where or when you go to school, one thing remains true: you’re going to need supplies. And here are Executive Essentials we have a great selection of back to school items like backpacks, messenger bags, laptop sleeves, pens, pencils and more. In fact, right now, Executive Essentials is having a ballpoint pen sale that includes a slew of great pens in all different styles from all different brands. This extremely simple, yet sleek and stylish pen has a flair that cannot be extinguished or ignored. This mighty writer measures in at 3-3/4 inches long. It opens with a twist and has a refillable cartridge that will keep you in ink for a long time to come. The entire housing is made of solid brass to give this small pen a bit a weight. Besides red, this pen comes in white, black and gun metal. The perfect back to school companion for the pop quiz in you. Back to school brings with it a lot of excitement, anticipation, learning, and…excuses. It seems that no matter how hard we try as teachers and parents, the kids always find a reason to go in the opposite direction we point them. Well, when it comes to homework, this Bullet Space pen from Fisher will narrow down their excuses to, “the dog ate my homework.” That’s because this pen can write in any direction, at any temperature, and in any liquid. It’s made out of brass with a titanium nitride finish, leaving it with a look that will make sure your student keeps it close at hand. Digging around in the bottom of a backpack or messenger bag, looking for the right writing instrument for class can be a drag. So why not gather up a few pens that are so bright they will be hard to lose? Caran d’Ache makes great, lightweight, durable pens that have a hip style and a ton of utility. Made of aluminum with a polished metal push-button, these fabulous ballpoints can take a heavy workload of papers and tests the yearlong. Besides yellow, these pens also come in red, orange, green, blue and purple. And of course, black. Coming in on the high end of the price chart is a wonderful ballpoint from Tumi Pens. At 50 percent off, this classic in white demands a student that understands the value in having a pen for the long haul. The ivory and silver colors combine to form a pen that exemplifies the word collegiate. The striking beveled pattern of the barrel-grip adds a sense of Victorian importance, while the slim, chiseled clip adds utility, without detracting from the pens overall, unique presence. By far, one of the best pens in the clearance section of the Executive Essentials catalog. Simply put, Retro 51 Pens is a fun pen company. They redesign our childhoods and our histories and roll them up into one of kind writing instruments that speak to us on a level like that of a good friend who we haven’t seen in a long time. This particular black Mickey Mouse pen is playful without being over done. Its modern look and feel give it a place in the hands of those who aren’t just yet ready to let all work turn into no play. And, if you happen to be looking for other Mickey Mouse and friends pen, Retro 51 has a wide variety of colorful pens just waiting for you. Take some time and look around the Executive Essentials catalog and find some great back to school savings on ballpoint pens, messenger bags, backpacks and many other items. This summer all across the nation, temperatures are extreme. Record breaking highs during the day drive people into their homes, shopping malls and grocery stores for a bit of cool air and respite from the heat. If they’re lucky, there’s water nearby. At night though, the warm air dissipates and the ground cools off as the sun melts behind the Earth on its 24-hour journey, leaving behind the United States in darkness – calm, cool and ready to rest. It seems these days that politics are much like the weather. Extreme in so many ways. With issues and topics too hot to handle and a 24-hour news cycle too eager to fuel the fires that polarize citizens against themselves. Opinions change fast, from hour to hour and decisions are made with little more information than what was gathered from the latest opinion poll on what is popular today or what may be popular tomorrow. But, politics are only one small part of what makes America – America. This nation, our nation, is a culmination of past, and future. It’s a slow march towards a horizon ever expanding. For democracy was envisioned to move slowly, steadily towards a goal that would benefit not only those that were successful but all who participated. Democracy was created as a foundation to moderate dissent, to moderate the majority and to moderate progress in order to obtain a greater good to be shared by all. Democracy was a vision. And now, the founding fathers that originally had that vision and spurred that vision on are being commemorated in a new Retro 51 line of pens. James Monroe, Abraham Lincoln, Thomas Jefferson and Ben Franklin are all part of a new tribute to those who created a vision of democracy that would last the test of time. These four men all have made great contributions to the survival of America. With their wit and their intelligence they have drafted and produced, decided and adjourned over the most tumultuous and devise periods in America’s history. Not only did they participate, but they prevailed with sound reasoning when much was had to be lost. The James Monroe Retro 51 Pen commemorates a man that would become the 5th president (and last Founding Father) of the United States. The Benjamin Franklin Retro 51 Pen pay homage to a man that created the first public library as well as the first public fire department. The Abraham Lincoln Retro 51 Pen celebrates a man that fought to hold a nation together as it tore itself apart over the issue of slavery. And the Thomas Jefferson Retro 51 Pen honors a man that drafted the original Constitution of the United States. 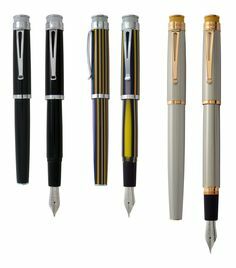 Put together from the finest parts and materials that have made the Tornado series from Retro 51 so popular for many years, these pens are sure to satisfy even the most ardent historian. With a good thick barrel and a smooth writing line that is thick and wet, these pens are historic in themselves. Go ahead and take a look at these and other Retro 51 pens offered in the Executive Essentials online catalog.